Mark has been coaching athletes of all abilities and sporting backgrounds from to 74 years of age for more than 17 years. Testing – Individual or group testing to evaluate plan and prepare the correct training programme for improved performance. Mentoring – Listen Observe Motivate Counselling and provide solutions. Triathlon Talks – Exhibitions Sport shops Health Clubs Rotary Clubs Women’s Institute Sporting Academies – Guest of honour at sporting awards events. Sports Nutrition – Individual advice prepared just for you – Lifestyle Training and racing nutrition for optiumn performance. 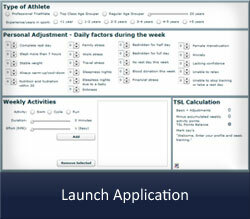 The Training Stress Level calculator was developed by Ironmate Mark Kleanthous to help athletes and people who enjoy sport pinpoint their training stress levels, give it a go by clicking below.